© 2009 The Patriot Update. Feel free to circulate this article, but please link / give credit to The Patriot Update. After observing Obama on the campaign trail and during his first six months in office, we have concluded that our President lives and governs according to his own set of “Ten Commandments.” They’re certainly NOT the Ten Commandments you learned in Sunday School. In fact, many are the direct opposite! To prove that our conclusions are correct, you will find a link to source documentation for each commandment on the Patriot Update web site. A former top deputy to Nation of Islam leader Louis Farrakhan tells Newsmax that Barack Obama’s ties to the black nationalist movement in Chicago run deep, and that for many years the two men have had “an open line between them” to discuss policy and strategy, either directly or through intermediaries. White broke with the group in 1995 and is now a professor of African-American history at the University of Central Florida in Orlando. White said Obama was “part of the Chicago scene” where Farrakhan, Jesse Jackson, the Rev. Jeremiah Wright Jr. and radicals would go to each other’s events and support each other’s causes. “Even though Chicago is the third-largest city in the country, within the black community, the political and militant nationalist community is very small. So it wouldn’t be uncommon for [Obama and Farrakhan] to show up at events together, or at least be there and communicate with each other,” White told Newsmax. Obama was careful to “denounce” Farrakhan’s comments – but not the man — during the Democratic primary season earlier this year, but only after Hillary Clinton called him out for benefiting from Farrakhan’s support. 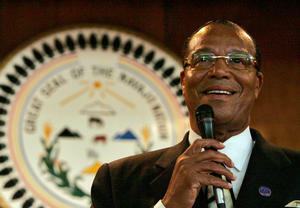 Farrakhan endorsed Obama in a videotaped speech to his followers at Mosque Miryam in Chicago in February. “You are the instruments that God is gonna use to bring about universal change, and that is why Barack has captured the youth,” Farrakhan said. He told the crowd that Obama was the new “messiah.” See Video: Farrakhan Endorses Obama, Calls Him Messiah. Once the news media and the Clinton campaign got hold of those comments from Farrakhan, demands mounted from all sides that Obama “renounce” Farrakhan. But as he has done repeatedly throughout this campaign, Obama was careful to parse his words. But Obama, once again, was less than candid. At the time, Obama was running for the Illinois Senate from Chicago’s South Side, a seat he won after getting surrogates to challenge the signatures on nominating petitions for his chief rival, the incumbent Alice Palmer. The march, which fell far short of attracting the million men it advertised, was organized by Farrakhan and by Obama’s then-pastor, the anti-white black nationalist Wright. Obama spoke at length with the Chicago Reader upon his return from the Million Man March. “What I saw was a powerful demonstration of an impulse and need for African-American men to come together to recognize each other and affirm our rightful place in the society,” he said. “These are mean, cruel times, exemplified by a ‘lock ’em up, take no prisoners’ mentality that dominates the Republican-led Congress,” Obama said. That award was the fruit of a long and deep relationship between the two men, White told Newsmax. In 1984, Wright accompanied Farrakhan on his much-criticized trip to meet Libyan leader Moammar Gadhafi, at a time when Gadhafi was considered an enemy of the United States. Wright also accompanied Farrakhan and Jackson to Syria in 1986, where they successfully negotiated with Syrian strongman for the release of downed American pilot Robert O. Goodman. In addition to the ideological affinity Obama expressed for the black nationalist movement, White believes that Obama owes much of his success as a public orator to speaking techniques that Farrakhan developed over the years, and exploited for years to great success. “If you listen to the rhetoric and you take away Obama’s political jargon, you hear a religious tenor to it that is very much Nation of Islam-like. I don’t know if anyone has ever touched on it, but Obama’s speaking style is very Malcolm-like, very Farrakhan-like,” White said. Any American who has listened to early radio or television interviews of Obama can hear how dramatically Obama’s speaking style has changed since he became a United States senator. In clips dating from 2001 and even early 2004, Obama speaks haltingly and in long, rambling sentences packed with legalese and dense pseudo-academic rhetoric. But not today. White began in the late 1970s as a foot soldier in the Fruit of Islam, the military branch of Farrakhan’s Black Muslim group, then rose to become a minister of the Nation of Islam and a top deputy to Farrakhan himself. Known initially as Brother Vibert L.X., and later as Minister V.L. Muhammad, he parted ways with Farrakhan not long after the Million Man March, after nearly 25 years within the organization. White’s 2002 book “Inside the Nation of Islam” prompted death threats by Farrakhan loyalists, so he left Illinois and moved to Florida to teach at the University of Central Florida. He told Newsmax that Obama’s remarkable speaking style, even his manner of standing at a podium to appear larger than life, is directly copied from Farrakhan. “If the Nation of Islam can’t do anything else, it can train people how to speak. And nobody can outspeak a Muslim minister,” he said. Earlier this year, a pro-Clinton blog run by former CIA officer Larry Johnson unearthed a 2004 photograph showing Michelle Obama and Farrakahn’s wife, Mother Khadijah Farrakhan, at an event hosted by Jackson’s Citizenship Education Foundation. Newsmax queried Obama’s U.S. Senate office, his Chicago office and his campaign press office about his ties to Farrakhan, but did not receive a reply. Ever since he appeared before the annual policy conference of the American-Israel Public Affairs Committee in June, Obama has attempted to convince the Jewish community that he is pro-Israel. But his longstanding ties to Farrakhan, Wright and Palestinian activist Rashid Khalidi, among others, have disturbed many Jewish community leaders. Sen. John McCain publicly chastised The Los Angeles Times on Thursday for not releasing a videotape the newspaper said it possessed of a 2003 dinner for Khalidi, where Obama reportedly accused Israel of carrying out a “genocide” against the Palestinians. On the campaign trail, Senator Obama hides behind carefully chosen words and vague statements of support for sportsmen and gun rights to sidestep and camouflage the truth. But even he can’t hide from the truth forever… his voting record, political associations, and long standing positions make it clear that, if elected, Barack Obama would be the most anti-gun president in American history. The facts speak for themselves. This election day, vote to defend freedom…because if Obama wins, you lose.